We are excited to present…Showem The Gold, a double-registered (AQHA & PHBA) 2 yr old palomino stallion by Dash Ta Fame-lengdary sire of multiple barrel racing champions in all arenas. Out of Shines Like New Money-a winning daughter of Fire Water Flit. This was mare is a PHBA World Champion and Reserve World Champion. She is half-sister to 2 AQHA Reserve World Champions and 2013 AQHA HI-PT Junior Barrel Racing Champion. This amazing young stallion bred and raised by Chuck and Lauri Givens of Richmond, Kentucky. Who also bred and raised the entire female family on Showem The Gold pedigree. Chuck explains, “We think a lot of this young stallion…he has all the attributes you look for in a stallion. I believe his future as a exceptional sire will be successful.” Showem The Gold is currently 15.1 H and weighs 1200 lbs with strong bone structure, good feet, conformation, athleticism, great disposition and a charming personality. Showem The Gold will stand to the public in 2015 with limited bookings at Chuck Givens Quarter Horses-Richmond, Kentucky. For more information: http://www.chuckgivens.com Foals will be eligible for Kentucky Breeders Incentive Fund and other programs as they become available. Coming soon “Gold Rewards” Program for colts by Showem The Gold. 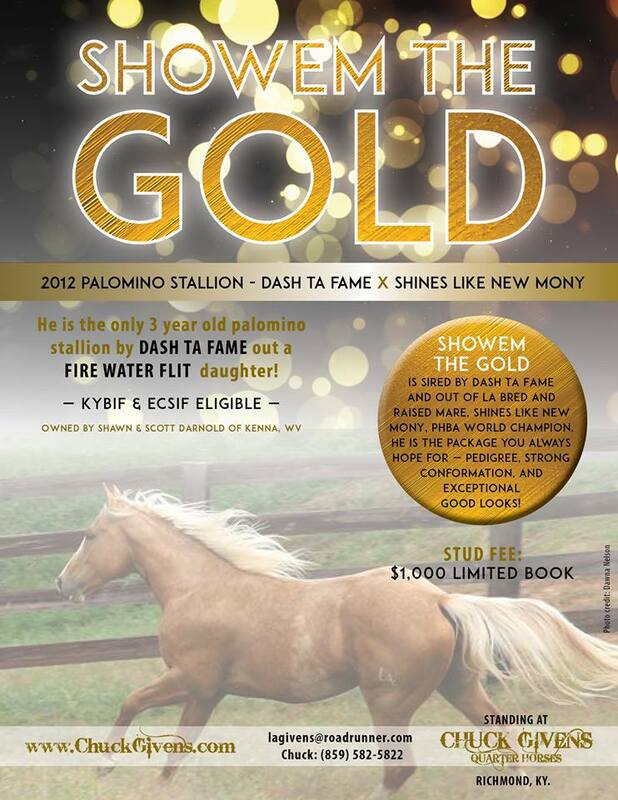 FUN FACT: Showem The Gold is the only 2 yr old palomino stallion by Dash Ta Fame out of an own daughter of Fire Water Flit. You can not go wrong if you have an LA on the hip of your horse, there is incentive money to be had from the ECSIF and many other programs when you ride an LA horse!